Among the myriad of diverse species discovered and described in the field of paleontology, Tyrannosaurus rex consistently enjoys the distinction of being the most iconic. Recognized from the very young to the very old, its fierce presence reigns over the realm of dinosaurs and fossils at large. Despite the elevated position of T. rex, there exist only a modest number of Tyrannosaurus rex specimens, from which this larger than life image is built. In the spring of 2015 an additional specimen was discovered from a few fragments of shattered bone on a grassy hillside in the Northeastern corner of Montana. An exhaustive excavation of the site revealed what remained of an adult Tyrannosaurus rex including a nearly complete skull and set of dentition. 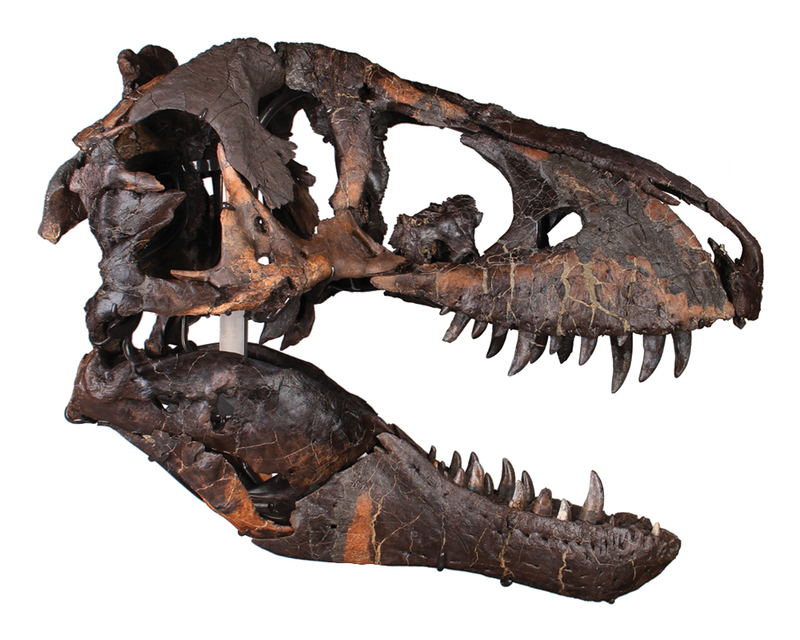 With heated debates on the morphology and ethology of Tyrannosaurus rex always changing our understanding of the species, new T. rex discoveries are valuable additions to the diverse but occasionally sparse collection of material available for study. The quality of skeletal and skull material collected with the specimen position TE-077 to be both an important specimen for study and a naturally beautiful display specimen. 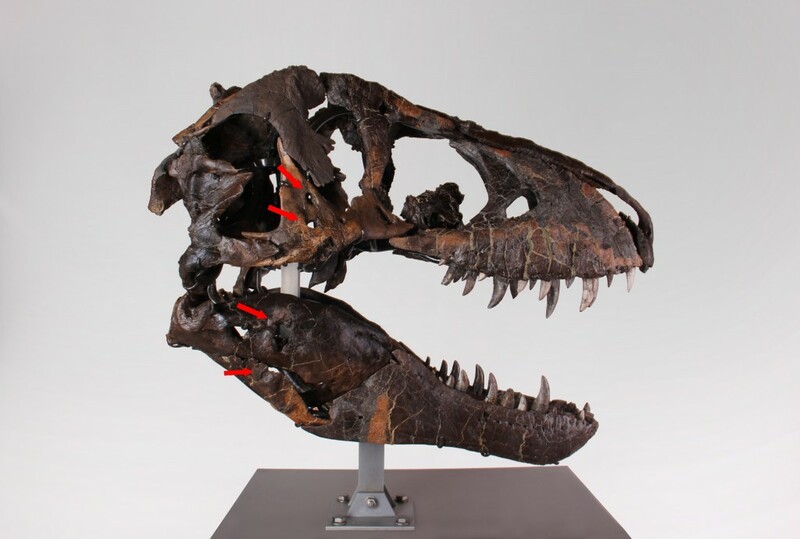 The extensive pathologies visible on the skull make TE-077 the most pathologic skull of T. rex ever discovered and give new insight into the brutal and violent world in which T. rex lived. The natural disarticulation of the skull allows for unique study of all of the skull elements and helped to prevent any serious distortions of the skull during preservation. TE-077 will make an excellent acquisition for any collection and may tell us even more about the Tyrannosaurids and life at the end of the Mesozoic. TE-077 dates to the Maastrichtian age of the Late Cretaceous epoch, roughly 72 – 65.5 million-years ago. Tyrannosaurus rex was the last known Tyrannosaurid and was among the last of the dinosaurs extant at the time of the mass extinction which abruptly ended the Cretaceous and the world of the dinosaur. 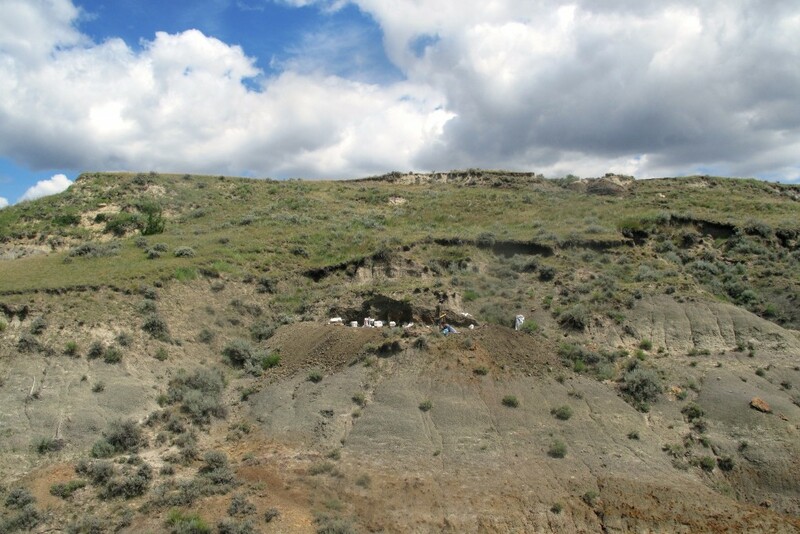 TE-077 was discovered in the Hell Creek Formation, one of the most prestigious geological formations containing Late Cretaceous strata. The Hell Creek Formation has produced some of the most well-preserved and significant fossils ever to be recovered including the Chicago Field Museum’s “Sue” the Tyrannosaurus rex. The Hell Creek Formation continues to be a valuable locality for researchers and has provided critical information into understanding the sudden decline and eventual extinction of all the dinosaurs at the end of the Cretaceous epoch. TE-077 was first discovered in the spring of 2015 under a grassy hillside above a deep wash. Small fragments of shattered bone discovered on the surface led to the excavation of a small outcropping. The small fragments, identified as theropod fossil, eventually led to the discovery of a Tyrannosaurus rex chevron and caudal. As the site expanded more tail material was discovered scattered beneath the hill, until disarticulated skull elements became increasingly numerous and led to a concentrated region of the site in which nearly all of the 93% complete skull was recovered. Although disarticulated, the direction of large skull bones and caudals, complimented by the site’s flow pattern indicated that the body of the massive predator, would have been weathered away by erosion and time, long before the site discovery. An exhaustive excavation continued to collect all of the material present and to verify the full extent of the site. The discovery of only cranial and caudal material may be explained by an unusual phenomenon found in numerous fossil specimens, causes for which are debated among paleontologists. Dinosaur and bird fossils have often been found to exhibit a characteristic posture, known as the “death pose”, in which the head is thrown back and the tail extended toward the head. Assuming this position before disarticulation of the skeleton, it is easier to see how an extended body, exposed and then eroded, could lead to the discovery of an isolated tail and skull. An extensive quarry map of the site, including photographs, preserves this valuable record, and will help in better understanding the conditions in which the specimen died and was preserved. 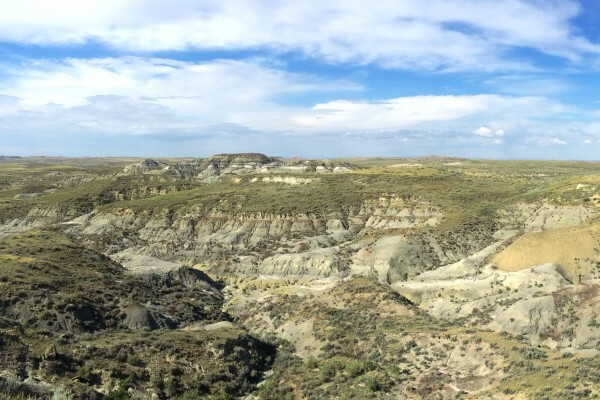 The Hell Creek Formation is a diverse deposition of fresh and brackish waterways comprised largely of sedimentary clays, mudstones, and sandstones. TE-077 was discovered in a dark gray clay layer exposed on three sides by long periods of erosion. The sediment layer, although largely uniform, contained small pockets of intermixed sandstone and several faults in the layer causing abrupt changes in elevation. Several rooted teeth where recovered upwards of 15 to 20 feet from the dentition, indicating a probably flow pattern to the northeast. A – Sandstone: Seen <1 meter up to 8 meters, depending on location in the site and the overhead slope, white to light-tan in color.. Poorly cemented, reaches up to topsoil. B – Dark Mudstone: 50-70 centimeters, dark grey with some rust-colored mineralization and rich in gypsum. This layer is easy to weather, and contains heavy plant fossilization. C – Green Siltstone: 1.5 centimeters, light earthen-green in color, minimal plant fossil evidence. D – Fossil-bearing Mudstone: 13-61 centimeters, medium to light grey in color. Layer holds lenses of blue-grey mudstone and shows evidence of sandstone mixing in the middle of the layer, down to pure or marbled sandstone near the base, possibly fining upward. All vertebrate fossils are contained in this layer except for two contacting the above layer and two encased in iron below. Blocky in nature. E – Iron Concretion Layer: 7-21 centimeters, deep red-purple and rust colored. Layer holds very dense nodules of iron and possibly limonite and becomes thicker when directly underneath large groups of fossils. F – Sandy Mudstone: Thickness unknown, this layer is similar to the fossil-bearing layer, just without any sign of fossil. Layer starts with medium gray blocky mudstone and mixes with sand as depth increases. Contains some plant material. All layers made of poorly-cemented clastic sediments of the upper Hell Creek formation. Local, small-scale faulting is seen over the entirety of the site with displacements up to, but no larger than 17 centimeters. 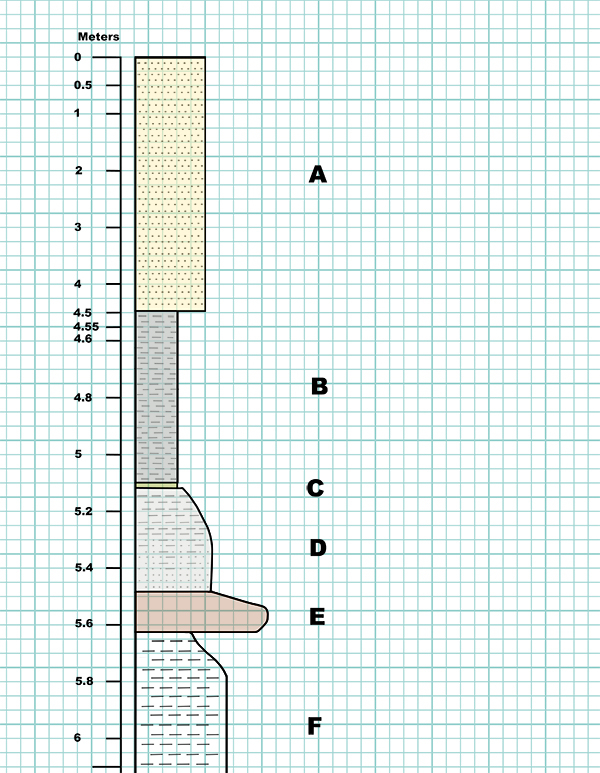 Stratigraphic column made from averages of layer thicknesses, for a generalized view of site stratigraphy. TE-077 is represented by 31.4% of the total specimen, based on an overall bone count of 296. The skull is 92.98% complete with 53 of the 57 skull bones recovered. 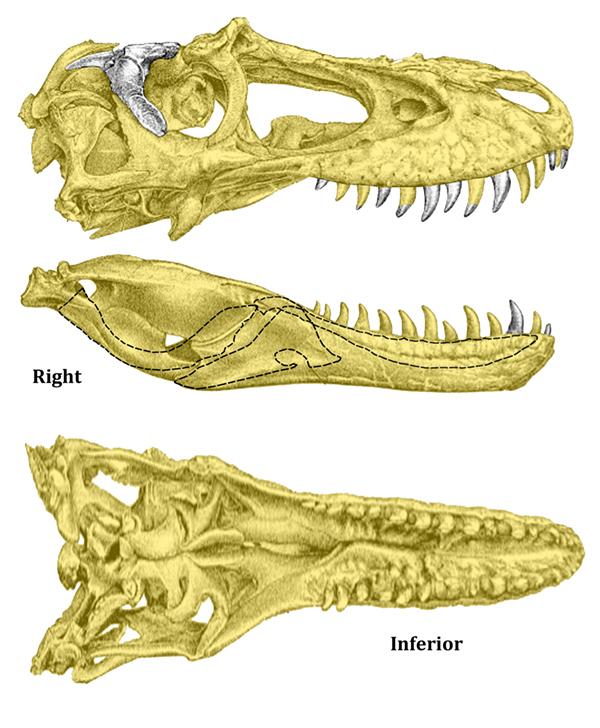 The disarticulation of the skull allows for each element to be studied and viewed from every angle and has prevented common distortions often found in articulated examples. 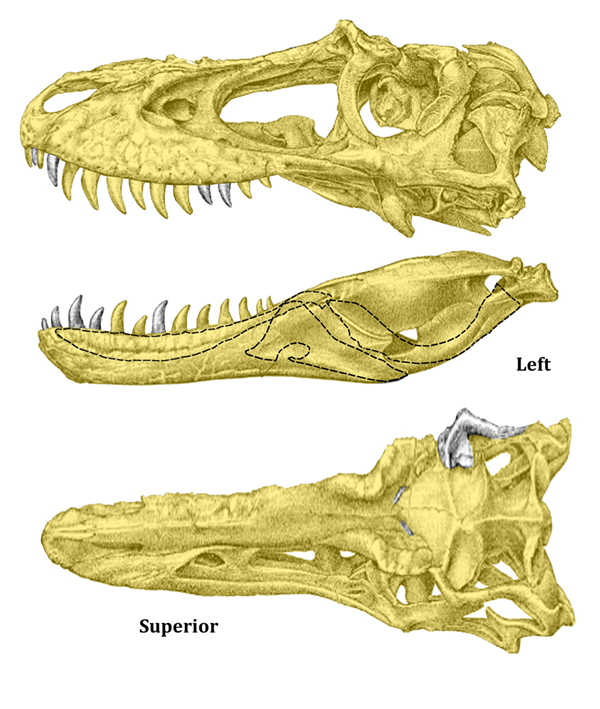 Nearly all of the external skull elements are present making the skull one of the most complete Tyrannosaurus rex skulls ever discovered. In addition to the collected skull bones, there are a number of ornamental skull bones, which although not represented in the skull bone count, elevate the completeness of TE-077. The preservation and condition of the fossils of TE-077 are truly excellent and museum quality. The fossils are extremely stable and bone surface detail is exceptionally well preserved. The patina is a light to dark brown, consistent with most fossils from the Hell Creek Formation. Fossil elements discovered above the frost line, can exhibit lighter coloration and root etching, but are likewise well preserved and stable for study or exhibition. There is no sign of “pyrite disease” or other mineral issues that would represent a problem with future preservation of the fossils. Most notable in the case of TE-077, is a series of puncture marks (PAG-02), which runs from the angular of the lower jaw upward through the surangular and across the whole of the jugal. It is probable that this represents a severe bite from another Tyrannosaurus during an altercation during the life of the specimen. Even more curious is that the some of the injuries show evidence of healing, while at least one in the center of the surangular appears to be an active infection. Pathologies provide a rare insight into the morphology and ethology of individuals, and can reveal valuable data toward a better understanding of how a species may have looked and behaved. More study will need to be conducted, including comparisons with pathologies on other Tyrannosaurus rex specimens, but TE-077 is likely to contribute considerable information to the study of dinosaur pathology. 1. Wolff EDS, Salisbury SW, Horner JR, Varricchio DJ (2009) Common Avian Infection Plagued the Tyrant Dinosaurs. The skull of TE-077 has been custom mounted on a steel armature, which completely preserves the natural disarticulation of the skull. Each bone in the skull has been fitted with a custom cradle, which allows for safe, secure mounting, while being 100% removable for study or shipping. The steel has been powdercoated for added protection of the fossils and the steel. 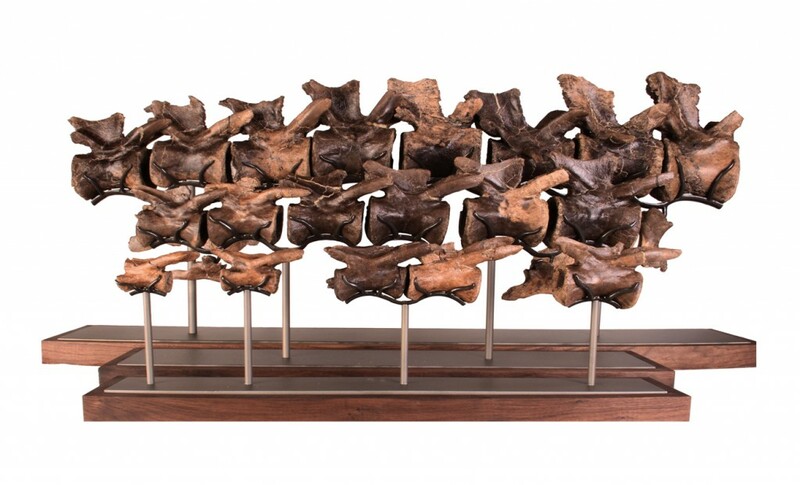 The custom armature is accented by a handmade black walnut base, which beautifully completes the overall presentation. Mount is exhibition ready and measures 46in x 36in x 75in. Black walnut base measures 46in x 36in x 23in.